Also known as Jimson weed and mad seeds, the common thornapple famously features in the books of Carlos Castaneda. The specific name stramonium comes from the Greek words strychnos, meaning “nightshade”, and maniakos, meaning “mad”. In the United States the plant is commonly know as Jimson or Jamestown weed. The name stems from the town of Jamestown, Virginia, where British soldiers were drugged with the plant while attempting to suppress Bacon’s Rebellion. The story goes, the soldiers spent eleven days appearing to have gone insane. Thorn-apple is also an ingredient in zombie powders (see the case of Clairvius Narcisse). Other names for the plant include concombre zombi, devil’s trumpet, devil’s weed, tolguacha, stinkweed, locoweed, pricklyburr, devil’s cucumber, hell’s bells, South African malpitte and South American chamico (from chamakani, “the diviner”). The Mayas of Yucatan used mehen xtoh-k’uh, “kleines Wesen in Richtung der Götter”, in the same way as Datura innoxia. It has a long tradition of use in prophecies and oracles (similar to Brugmansia sanguinea). The Algonquin and Luiseño of North America also used the plant in sacred ceremonies. In Mexico Datura stramonium is considered the “younger sister” of Datura innoxia. The Mixe of Oaxaca believe, the plant is housed by a spirit called ta:gamih, “the grandmother”. She is called upon to heal and divine. In ritual the males use 3×9=27 seeds and women use 3×7=21 seeds. In Mexico the catholic church believes the plant was created by the devil. In Europe the common thorn-apple is associated with witchcraft, flying ointments and hex rituals. The seeds have been added to beer as a narcotic. Gypsies knew the thorn-apple well: they use(d) the seed in ritual to banish and attract ghosts. In the night of the 30th of November the seeds were placed outdoors and the next day thrown into a fire. If the seeds cracked loudly, the winter would be hard and dry. For divination gypsies placed 9-21 seeds on a marked animal skin and beat upon it, so that the seeds moved and, depending on the position – on or between the marked lines – a sick person could be cured or was damned. Range: Common thornapple is found throughout the old and new world. It is found spreading throughout Eurasia, the Kaspian Sea, Mexico and the North American east coastal region. Colonists brought it to Mexico. Today it is spread over the Canary Islands, the Himalaya (Nepal, purple variant) and Central and South America (Datura ferox). It also grows wild in Germany and Switzerland, where it thrives in wasteland. In some places it is considered a weed. The seed is thought to be carried by birds and spread in their droppings. It can lie dormant in the ground for years and will germinate when the soil is disturbed. 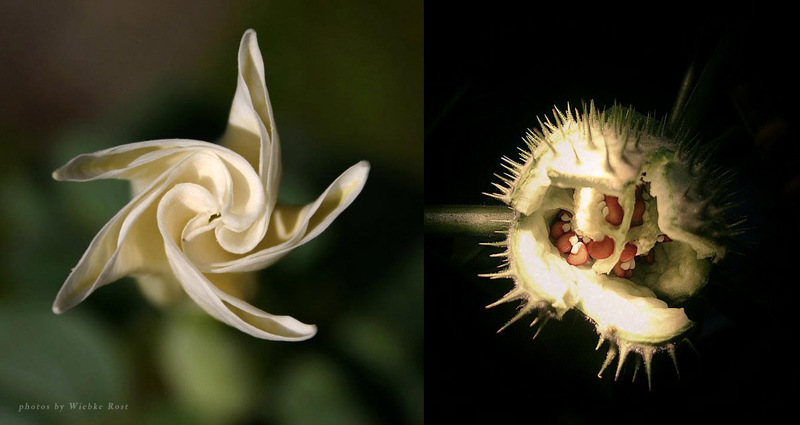 Variants: There are two variants of Datura stramonium. The ‘stramonium‘ variant has green stems and plain white flowers. The variant named ‘tatula‘ has dark purple stems, the leaves are a darker green and the flowers have a purple tinge. Also called devil’s trumpet, Hindu datura and Horn of Plenty. 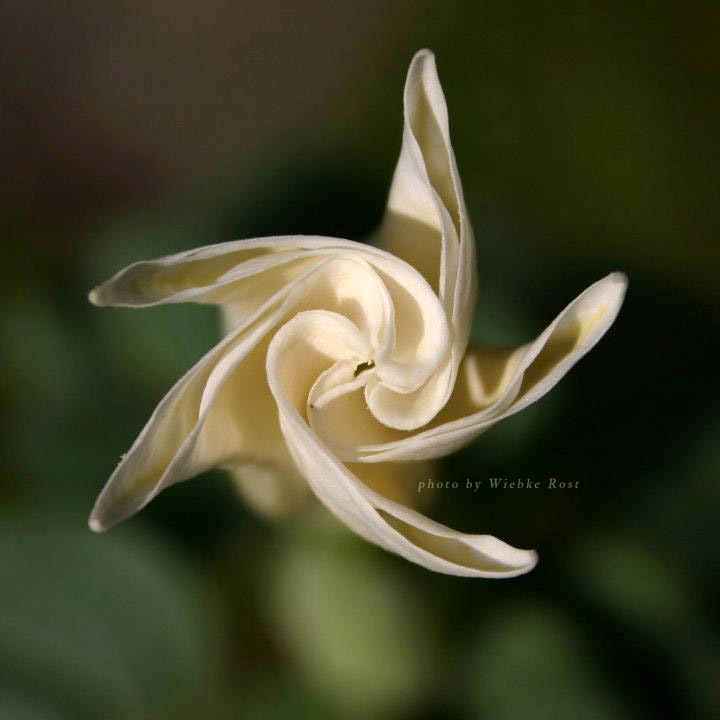 In Hinduism it is sacred to Lord Shiva, who is envisioned smoking datura. People still provide the small green fruit of datura during festivals and special days as offerings in Shiva temples. It also plays a roll in Tantric rituals. Datura metel is a perennial and originally has white or yellow flowers. The leaves and stems are covered in fine hairs. 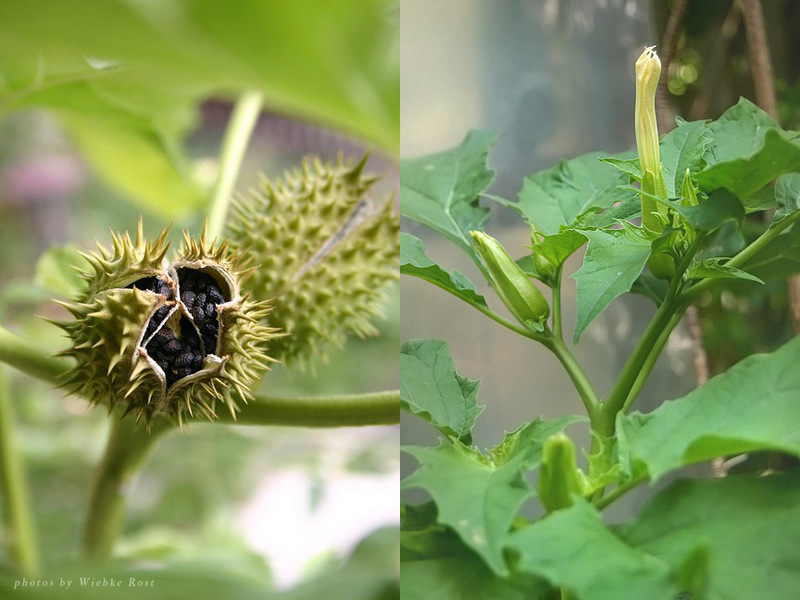 However, there is a black-stemed cultivar, Datura metel var. ‘Fastuosa’. It is hairless and has deep green glossy leaves. The flowers are of a deep purple color on the outside and white inside. They come single or filled. Hence this cultivar is also known under the names ‘Black Currant Swirl’, Cornucopaea, ‘Double Black Currant Swirl’, ‘Double Purple’, as well as black or purple Hindu datura. The cultivar has become naturalized in Israel, where it grows up to 1,50 m tall. I tried to grow these form seed with varying success. The best seeds I got thus far were from a seller in Malta. Sadly the plant didn’t do well here. Dispite climate change our summers have been rather rainy and not as warm and sunny. Also known as downy thornapple, tolguache or toloache, toloatzin and moonflower. The flowers are white and 10-toothed. The fruits are densely covered with spines and contain the orange-yellow seeds. The plant is pilose all over, which gives it a silvery gray appearance. Aztecs used it for healing purposes and rites of passage. The specific name innoxia means “without prickles” or “harmless”. Though this plant is nowhere any less harmful than its relatives. The Mexican name toloatzin consist of the word toloa, to “bow one’s head”, and the ending -tzin is added as a diminutive. Aztecs used toloatzin long before the arrival of the Spanish conquistadors, e.g. as anodyne in poultices placed on wounds. Aztecs also warned against madness and “various and vain imaginings”, yet many native Americans used the plant as an entheogen for hallucinations and rites of passage. 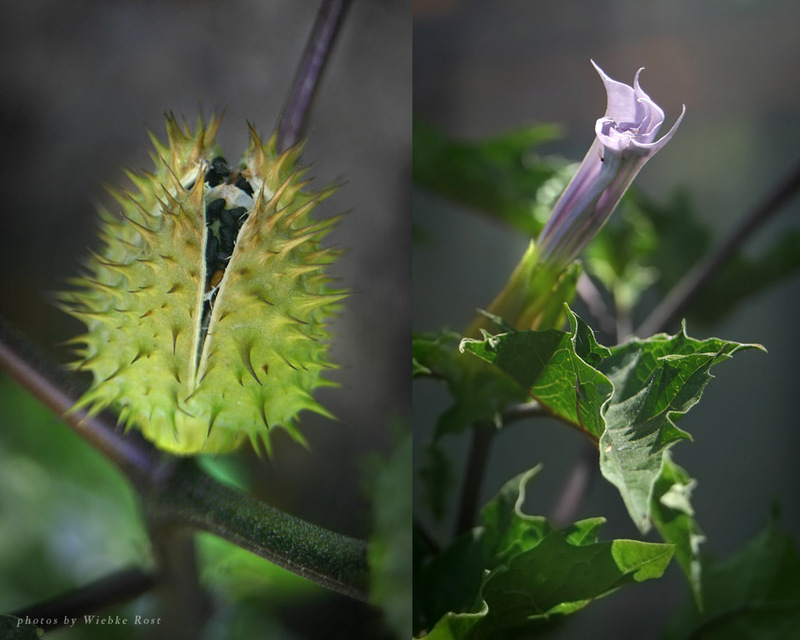 The Chumash of California used this datura in the vision quest for adolescence; they drank a tea of the plant to open themselves to an animal spirit, who taught them a song or dance and who would guide the person throughout the rest of their life. Later both men and women drank datura tea on their own, to strengthen their bond with their spirit helper (famulus) and to communicate with the dead or divine the future. In Castaneda’s writings the plant is also referred to as “la yerba del diablo”. In Navajo religion this plant is emblematic of the Changing Woman, a goddess who can take the form of a maiden, mature woman and crone. Downy thorn-apple is native to Central and South America, and has become introduced in Africa, Asia, Australia and Europe. due to this the plant is now considered an invasive species in some regions. E.g. its life cycle is similar to that of cotton and it has become a pest in cotton fields. It is also a potential seed contaminant. The seeds have hibernation capabilities, and can last for years in the soil. The perennial rhizomes can be overwintered indoors and re-planted in spring. The sacred datura looks similar to and is thought to be a subspecies of Datura innoxia. It has bright-purple tinged flowers, which are 5-toothed. Toxicity: All datura species contain tropane alkaloids (atropine, hyoscyamine and scopolamine). Ingesting any part of the plant can be fatal in humans and other mammals, including livestock and pets. In some places it is therefore prohibited to buy, sell or cultivate datura plants. There are also several reports in the medical literature about deaths from intoxication with Datura stramonium and Datura ferox. In some parts of Europe and India, datura has been a popular poison for suicide and murder. 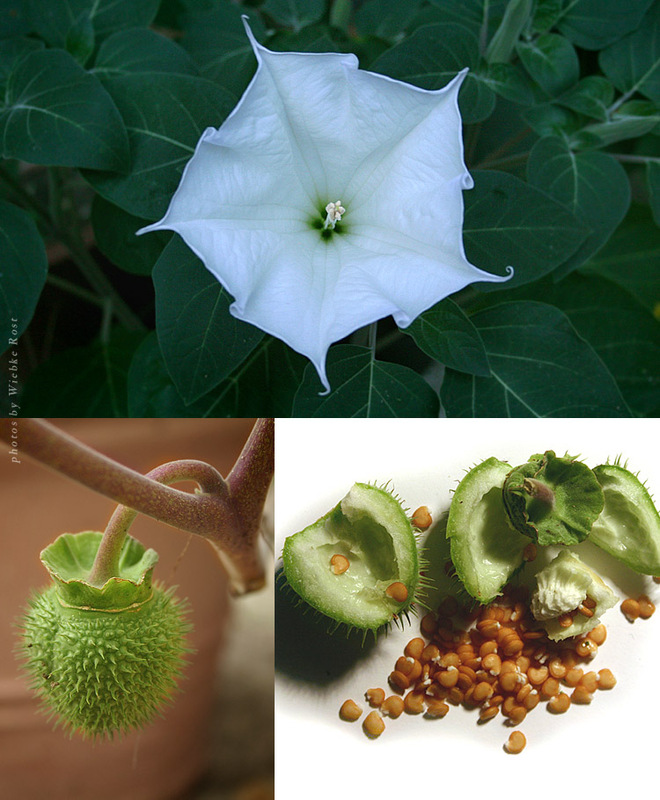 From 1950–1965, the State Chemical Laboratories in Agra, India investigated 2,778 deaths caused by datura ingestion. The amount of tropane alkaloids varies greatly from plant to plant, as well as within the plant. E.g. consumption of a single leaf can already cause severe symptoms. Symptoms of poisoning include flushed skin, headaches, hallucinations, convulsions, and subsequently coma. 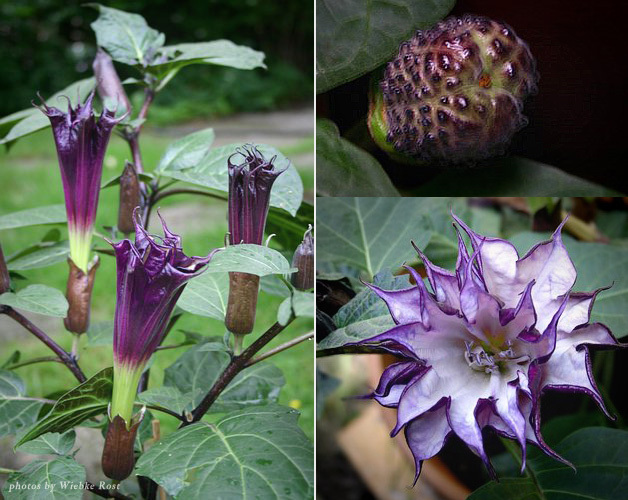 Opposed to mere hallucinations, poisoning with datura can lead to a complete inability to differentiate reality from fantasy (anticholinergic delirium), hyperthermia, tachycardia, bizarre and possibly violent behavior, severe mydriasis with resultant painful photophobia, which may last for several days. Pronounced amnesia is another commonly reported effect. Symptoms resolve, usually from 24–36 hours after ingestion. No other psychoactive substance has received as many “train wreck” (i.e., severe negative experience) reports as datura. The overwhelming majority find their experiences mentally and physically unpleasant and often physically dangerous. Specific scopolamine effect: during delirium, the person panics and attempts to run for shelter. Scopolamine causes loos of sight. The person loses orientation and becomes involved in an accident and end up at hospital. Scopolamine induces respiratory depression at a hallucinogenic dose. The combination of anesthesia (in the hospital) and datura is usually fatal due to combined respiratory depression. Seizures and fevers as high as 43 C (110°F) have been reported.